At Ultrasound Blinds we want to give you a choice in different ways you can operate your blinds. There are both manual and motorised options available. These are designed for you to decide which operating system is best suited and convenient for each specific blind you have. Alongside manual controls, spring assisted structures are occasionally available, depending on the blind. This helps ease the blinds from inside the control box, allowing the user to pull the blind up a lot more simply. 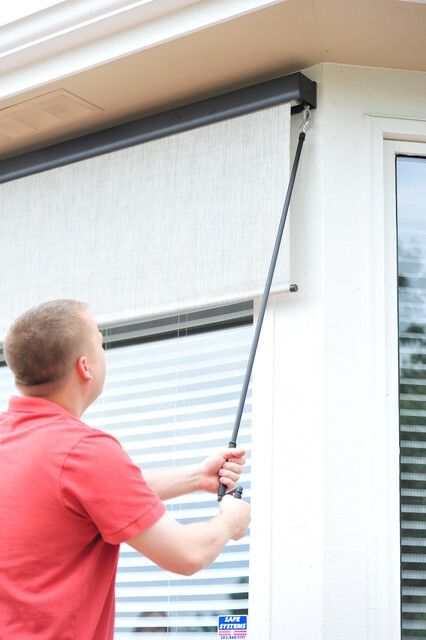 On roller blinds, there is also options for spring operation where on smaller blinds you can control the blinds by pulling the blind directly down from the centre. Chains and wands are the most traditional and simple means of operating blinds. 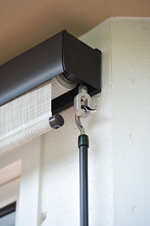 The Standard chains are fuss free and come in a variety of colours, to best suit the design of your blinds. Chains can be used for most blinds except in hard to reach places e.g. Rooflight blinds. Wands are used to adjust the rotation of the blind and are the most commonly with venetian and verticals. Crank mechanisms are effective for operation of oversized blinds. Operated by a magnetic detachable crank handle, and accommodating robust grooved aluminium barrel, this system is built to last. Cranks are also used for blinds that are high up and not easily reached. Once you’ve chosen your beautiful new blinds from Ultrasound Blinds, why not make them even more impressive by integrating smart technology to control their movements at the touch of a button. We offer a wide range of motorised options, whether it’s for achieving the maximum BREEAM rating or to integrate within an Audio Visual (AV) system, motorised systems are the ultimate way to control your blinds. If there is no mains power available to operate the motorised blinds, battery powered systems are a great option that will last for years before the batteries need changing. Rechargeable options are available as well as solar panel systems insuring the batteries are topped up. Allows user to be in complete control of the blinds, which is ideal if in the home with children, or in the office with staff. 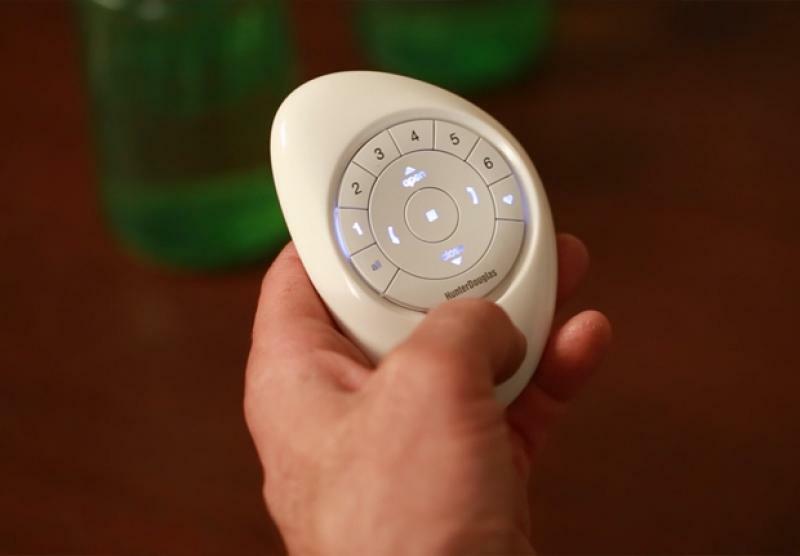 The remote control is easy to operate with only a few buttons keeping the motorised option simple. 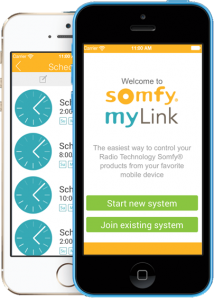 You can pre-set many different groupings of blinds, either individually or together, right from the palm of your hand. Able to adjust blinds as well as many other features of the house (lighting, heating) with the same control pad. Schedule your blinds to operate at your desired times of the day automatically. Operate your blinds remotely, from the other side of the world with your AV systems app from phone/tablet. For large roof lights we offer tensioned motorised blind systems that can provide complete control. We can manufacture from as small as 500mm wide too 4000mm wide and are only limited to the draw (length) by the clients chosen fabric. This is a unique solution for areas that require total black out or large windows that are not air tight. Due to the zipping system the fabric effectively locks itself within the side channels blocking any light from creeping in from the sides of the blind, whilst also preventing the fabric from being pulled out of the channels due to air pressure between the blind and window, this only occurs on poorly sealed windows and adds to an extra layer of insulation. 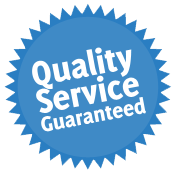 We offer 5 years warranty on all our motors and you can rest assure that if any faults occur with a motorised system we have extensive knowledge and will provide speedy and effective responses.